Sand cats live in three distinct regions of the world: Africa’s Sahara desert, throughout the Arabian peninsula; and in parts of central Asia. Sand cats prefer a very dry, arid habitat with little vegetation, for which they are well adapted. They are sand-dwelling, inhabiting dry plains and rocky valleys where conditions are extreme. Surface temperatures can reach 124 degrees Fahrenheit during the daytime, then drop to as low as 31 degrees Fahrenheit at night. Sand cats have dense hair and pads on the soles of each foot that protect against the intense heat and cold of their habitat, as well as aiding in movement across the sand. 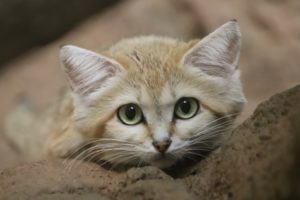 Sand cats are small, solitary cats that have pale sandy to grey-brown coat, which is slightly darker on the back and pale on the belly, with occasional stripes on the legs. Bold, red streaks runs across each cheek from the corner of both eyes. Sand cats have a broad head with large eyes and low-set ears and they have short limbs. Size-Body length ranges from 18 to 22.5 inches (45 to 57 centimeters), with the tail adding on an extra 11 to 14 inches (28 to 35 centimeters). Adult sand cats weigh between 3 to 7.5 pounds (1 to 3.5 kilograms). Sand cats have dense hair and pads on the soles of each foot that protect against the intense heat and cold of their habitat, as well as aiding in movement across the sand. The current population of sand cats is 33 animals (19 males, 14 females) distributed among 12 AZA institutions and one private North American facility. Sand cats eat primarily small rodents and will occasionally eat hares, birds, spiders, insects and reptiles. They are fearless snake hunters—their prey can include venomous vipers and other snakes. Sand cats are opportunistic feeders out of necessity. And like many desert-dwelling species, sand cats can survive for weeks at a time without drinking water. They will instead obtain any moisture they need from their prey. Sand cats are mainly nocturnal (night) and crepuscular (dawn and dusk) cats, avoiding the intense heat of the desert by hiding in burrows. They rely on their ability to dig to create shelter from extreme weather. During the breeding season, the dominant male and female within the group will mate. They will build a nest inside a tree or along a rock face. The female usually lays two eggs. Incubation will last for about four weeks, and although two hatchlings might hatch only one will survive through the first few days. A chick will remain in the nest for up to twelve weeks and will continue to be fed for up to nine months. The rest of the social group will assist the mother in parental duties. These birds have various types of cultural significance in their native range. Throughout the Southern Ground Hornbill’s entire geographic range, isolated local cultures believe it to be a protection against evil spirits, lightning, and drought. These birds are thought to be “unlucky” and signifiers of death particularly in South Africa, Zimbabwe, and Malawi. It is thought of the same way in Kenya and Zimbabwe, but is fiercely protected and often avoided due to the power it has to bring calamity. In Zimbabwe and Malawi, it is thought that consuming parts of the bird, such as placing the bird’s ashes under the tongue, can allow a human to harness powers such as foreseeing the future or finding hard-to-locate food items. Lastly, the seasonal nature of this bird means that cultures in South Africa, Malawi, and Tanzania use it as a timekeeper. It can indicate the start and end of a work day, or when it moves to a new area can mean the start of the rainy season. Vulnerable. Major threats include habitat loss, grassland erosion due to livestock grazing, and power line collisions. Rafiki is the Zoo’s male Ground Hornbill, and Nala is the female Ground Hornbill. Both of these birds were born in Tanzania in 1998. This is the third zoo that they have lived in. They previously lived at the Winnipeg Zoo and the San Antonio Zoo. They have been at the Birmingham Zoo since the fall of 2012. The red, bare patches of skin on their face and neck are generally believed to keep dust out of the bird’s eyes while they forage during the dry season. When hunting, they either kill the prey instantly by snapping the beak, or stab the prey repeatedly. The whole family will hunt as a group to take down large animals such as snakes.